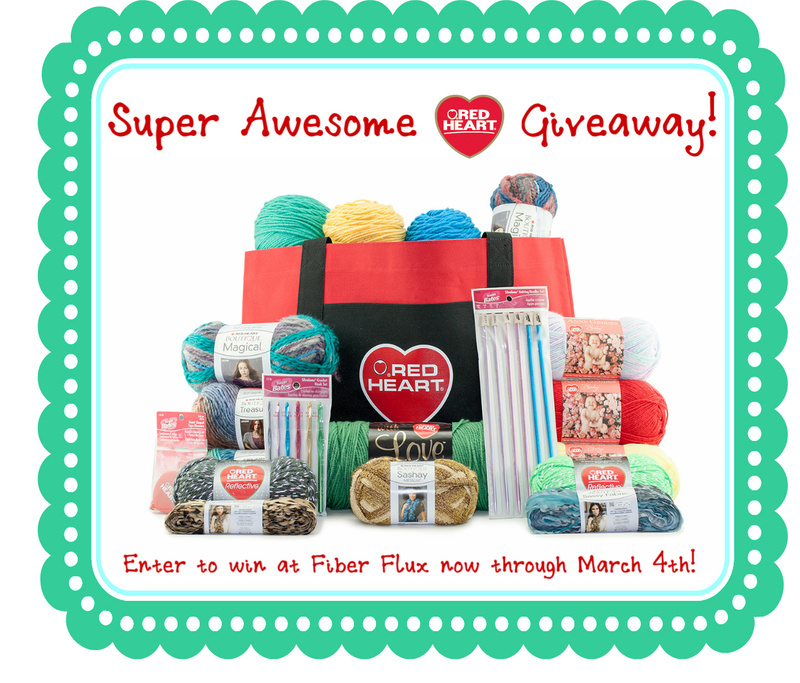 Fiber Flux: Last Day to Enter the Huge Red Heart Yarn Giveaway! Last Day to Enter the Huge Red Heart Yarn Giveaway! Today is the last day to enter the Super Awesome Red Heart Yarn giveaway! A winner will be selected at midnight tonight (Eastern Standard Time). If you haven't entered yet, be sure to check it out! My favorite is the reflective yarn. I would love to crochet a blanket. Love sashay! Beautiful for versatile scarves to give away or keep for yourself. Just started following the blog and love it! Thank you! Considering that it is 17 degrees F outside this afternoon, that skein of With Love looks scrumptious and warm! :) I could make a warm shawl with that yarn. Love the magical. I would actually make a scarf for myself out of it. How awesome for someone to be lucky enough to win this prize package!! I love the green Red Heart With Love! Jennifer you and your site are amazing and I love your tutorials on You Tube. My favorite Red Heart yarn is With Love, but I'd really like to try the new Reflective! Thanks Jennifer and Red Heart! I think the Magical looks intriguing! I'd love to see how it proves to be magical by crocheting a blanket for my friend's new baby!!! I sure hope I win the big give-away! I need the yarn! Using Red Heart Soft for my first crocheted blanket! Everyone just loves it. I love this site and Red Heart Yarn. I would use all of the yarn to make items for charity. I love the "Love this yarn". I really can't wait to get my emails from Fiber Flux. You and Red Heart show so many new crochet patterns that I look forward to. Cindy B. My favorite is the Red Heart With Love! But I love everything in the giveaway :) Fingers Crossed!! Favorite is "TREASURE" and "MAGICAL"....but LOVE is grand too....just love all yarn!!! I would love to win this. Crocheting is part of my arthritis therapy! I think I would knit a sweater with the green skein of Red Heart With Love. I'd also really like to try Heart & Sole for socks. Would donate most of what I won to my yarn group that gives away what we make. I need some skeins of blue Red Heart baby yarn (any one of them) to crochet baby blankets for an upcoming little boy. My friend had a little girl two years ago & I crocheted her pink baby blankets using Red Heart yarns. Now she's going to have a little boy in April & she has requested blue baby blankets. I guess I'd better get started soon! :) I would love to be able to say I won the yarn just for her new little boy. My favourite is the Magical. I would make a baby blanket. I cannot help but love the Sashay yarn...a cute little scarf, in a short amount of time!!! What a fantastic giveaway, Thank You!